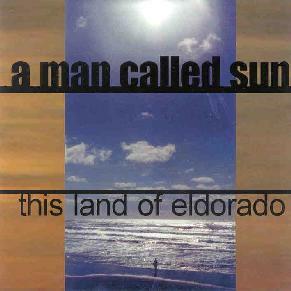 A Man Called Sun - "This Land Of Eldorado"
This release documents the musical history of a band that earned a strong following in the northwest US before going their separate ways. Mellow, celestial rock is how I would sum them up. They strike me as a blend of Daniel Lanois and a very toned-down Kingston Wall. The label describes them as the U2 of the northwest, (Lanois is U2's producer, by the way) so even though the music is marketed to a popular audience, I still find it pleasing. These songs blend together like one long piece even though they were taken from different time periods. The style is closer to ambient space than to engaging rock. Even the vocals are nearly inaudible and mostly indecipherable. Melodies and harmonies are the driving force regardless of whether they come from the bass, keyboards, or vocals. They are the binding force behind these ethereal songs, so the instruments and voice don't really take off on their own wild fancies. Repetition, ambience, calmness, and pure atmosphere define this album. If I were to pick a category, I'd call this ambient rock with heavy emphasis on the ambient. The band have mastered a difficult balance of styles. It's great stuff to relax with when prog seems too aggressive and ambient seems too intangible. This is the type of CD you turn to consistently over a long period of time when the moods is right rather than something to plunge into for a month at a time. For more information you can visit the A Man Called Sun web site at: http://207.178.45.136/amancalledsun/index.htm. This Land Of Eldorado is distributed by Ammonite Records. Contact via snail mail c/o Ammonite Records; ; Brandon Gillis; 4513 192 Ave SE; Issaquah, WA 98027.